Just to fuel idle speculation, rumor, and gossip, I thought I'd share a few projects that we're looking into or working on. It's important to understand that so far these are only a glint in our collective eyes and they may never come to fruition. I'm still trying to import a bike like the Araya Randonneur shown at left. 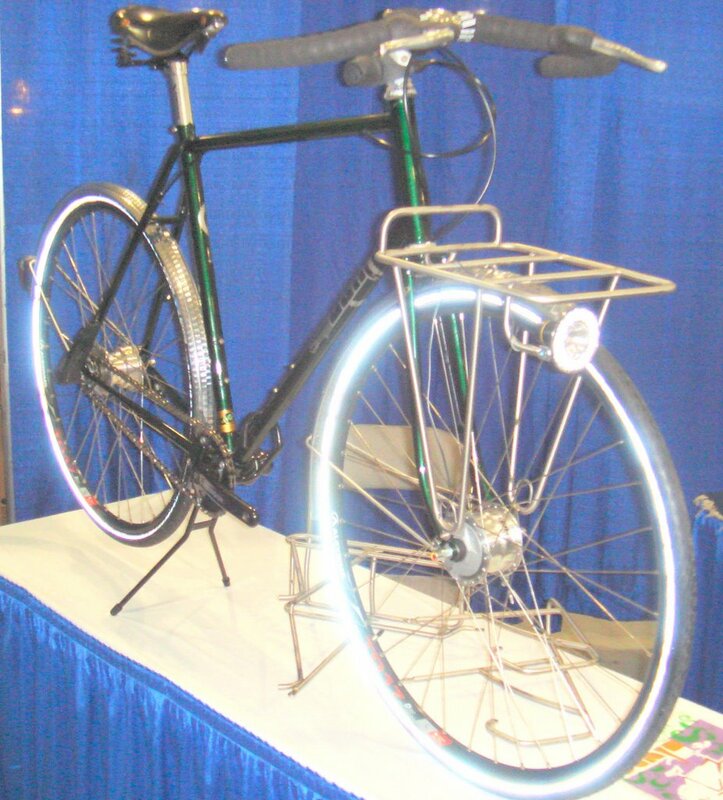 This bike has a double butted lugged frame, hub generator, full lighting, fenders, a front rack, etc. The goal is to sell it complete at around $1500. Would you buy one? 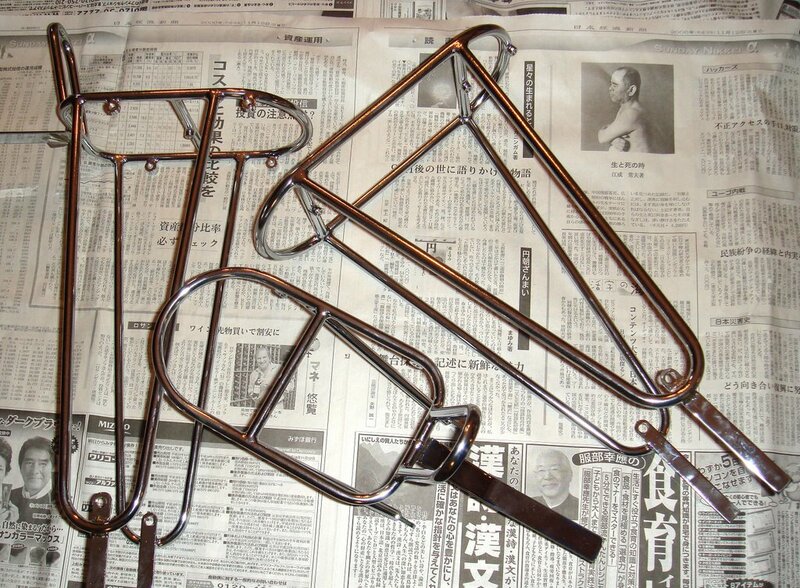 We'd also like to develop a Velo Orange water bottle cage that look a little like the Toei cage, but costs $20. 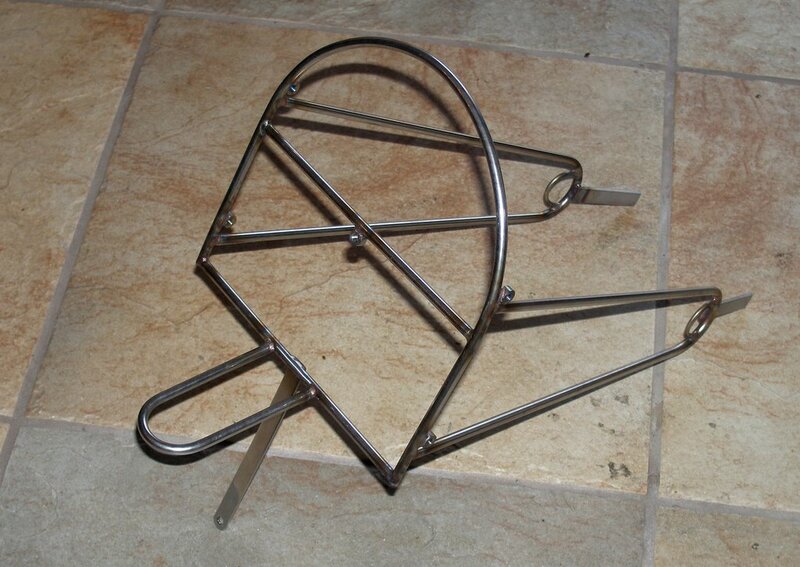 Then there is the long quest to make reproduction Herse stems and Herse straddle wire hangers. The hangers look like they may become reality; it's too early to speculate about the stems. 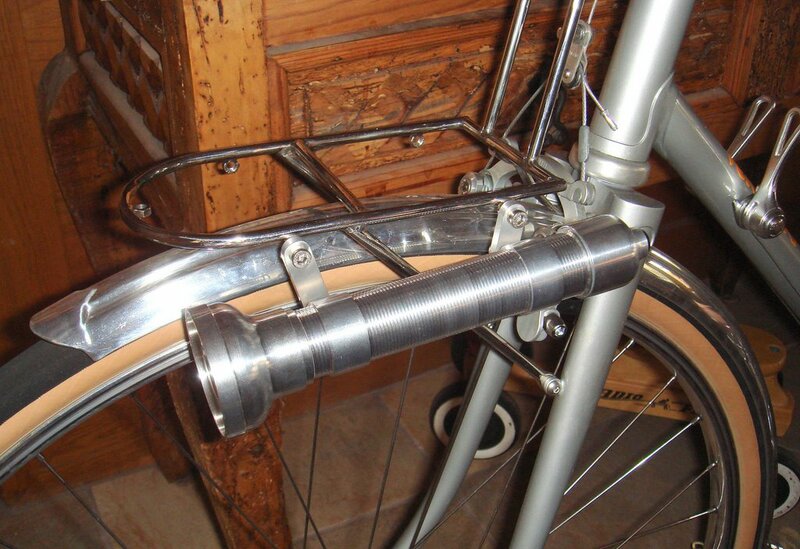 I am hopeful that we'll have a stainless steel version of Velo Orange fenders in 40mm and 50mm width in a few months. I've also started thinking about a less expensive European-style city bike, 5-speed internal geared hub, fenders, TIG welded mixte and mens frames, but outfitted in classic VO style. 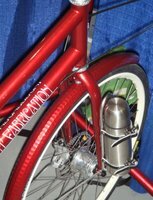 These bikes, at around $500, would probably not carry the VO name, but be a separate lower end brand. Velo Noir? We have asked Ostrich to consider making a TA bag copy for us now that they are no longer making bags for ALPS. They have taken it under advisement. Any thoughts or suggestions for other products? You have to love the French. 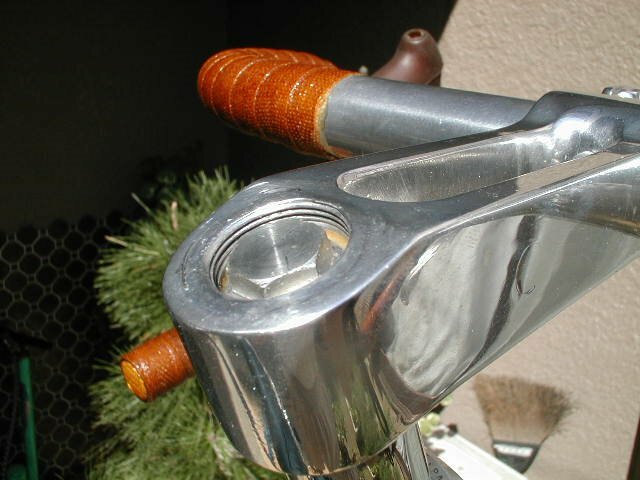 Who else but the French could design a reverse brake lever as elegant and beautiful as these CLB levers? We found a few NOS pair, but they are so hard to get that we'll only sell them with a city bike frame for now. Just when you're about fed up with a certain French company that never ships on time, they do something very nice. 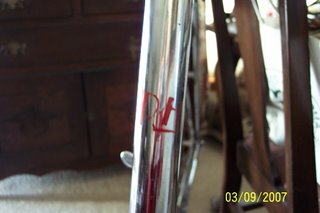 Many of us have been searching high and low for the old silver and black metal foil decals that graced older TA cranks. A friend just sent me a pair from Japan and I was thrilled to get them. Now TA has reprinted them. 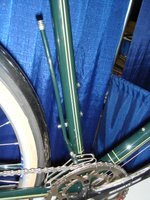 These things have not been used on cranks since the early '80s, yet TA looked out for their customers needs and supported a 30 year-old product. Of course I got as many decals as was possible, which is not many. But I'll ask you not to buy them. That is don't buy them unless you really need them and don't buy extras. Lets let other folks get some too. 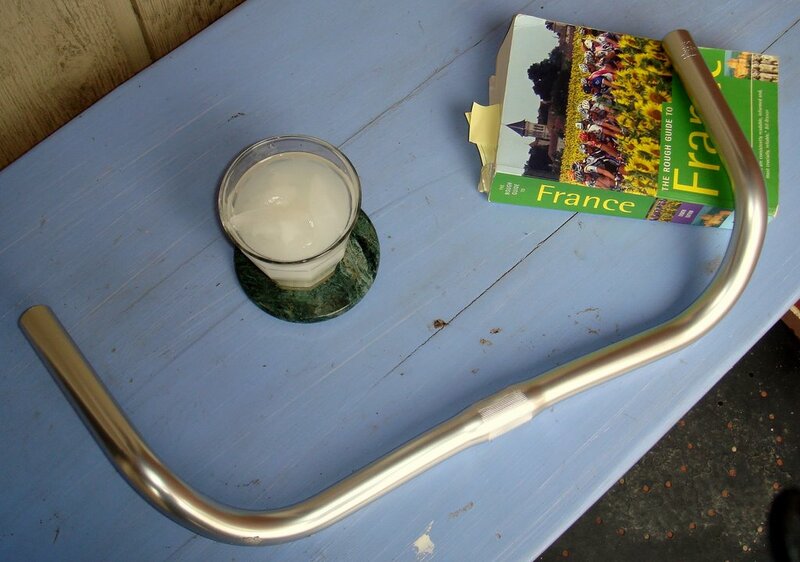 Speaking of French parts, we should soon have NOS and very cool French city bike bars and stems (22.2mm stems). Remember that cool ALPS pass hunter photo I posted. It's the one that Peter Weigle-san used as inspiration. Ernest, from Japan, sent me the identical LED light that's made for ALPS. He also sent the proper mounts. It's a magnificent piece of precision machining. 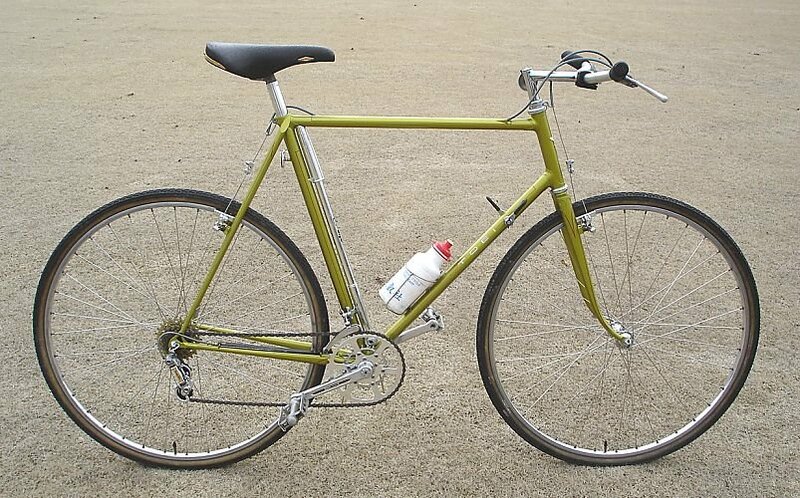 UPDATE, WE WILL HAVE HONJO FENDERS IN ALL SIZES AGAIN BY LATE NEXT WEEK. This is our new space. It's only 1200 square feet, but it's a couple of blocks from historic downtown Annapolis. It'll be an atelier, gallery, showroom, or something. But it will not be a regular bike shop. Whatever it will be, it will be open, in some form, on the afternoon of April 15 and you're all invited to drop by for a glass of wine, snacks, and to either see some of our products or help us unload boxes, depending on how close to being finished we are. I'll post details and a map later. Earlier that day you might want to attend The Ride for Shelter. It's a neat bike ride in Annapolis to raise money for the local homeless shelter. I was told this morning that I'd volunteered to run the swap meet. So bring all your old bikes and parts. We'll ask you to donate a small percentage of your take to the shelter. I'll post details on that too. 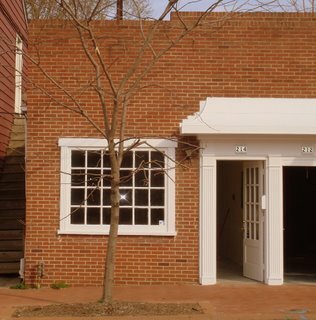 One of the reasons we live in Annapolis is that it's as close to a small European city as you'll find in the US. There are narrow brick streets, an old harbor, lots of cafes and restaurants, little B&Bs, artist's studios, many (almost) secret passageways between the streets, and even a couple of very old colleges. So you might make it a weekend and enjoy the place. If you've been to the store today, you might have noticed many items on the home page are on sale. 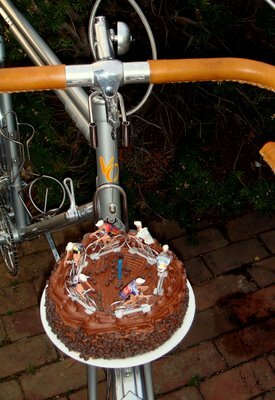 Since today is Velo Orange's first birthday we decided to start an annual sale. 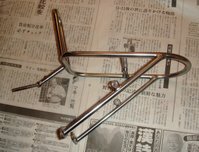 I'd have put more sale items in the store, but we spent most of the day packing Honjo fenders. You guys inundated us with fender orders. 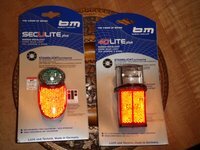 Please check back in the specials section over the next few days as we add more items. 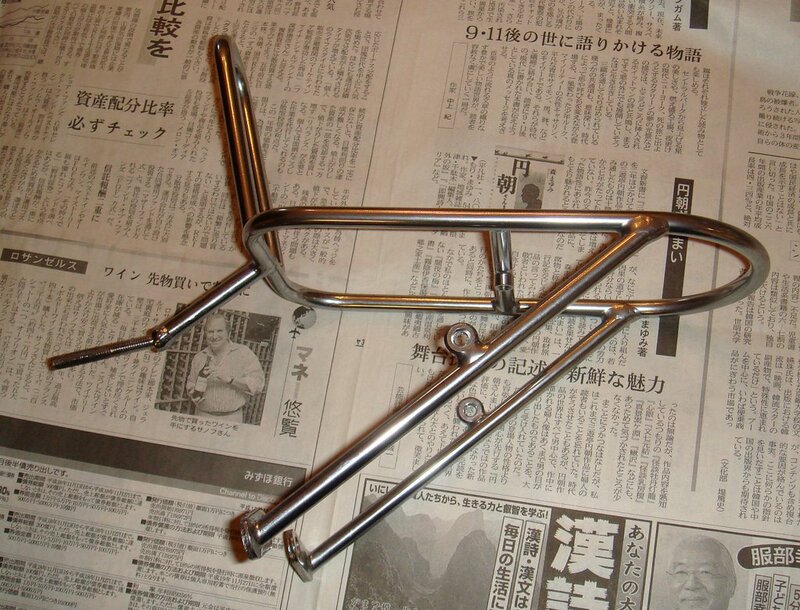 The Extra Long Honjo Fenders are Here! It took 4 months, but our custom made 43mm Hammered fenders are here. So all of you who have been waiting can order them. These are as long as the traditional French models that have not been available in decades. There is room to mount a headlight on the front and the back will really protect your feet from spray. I'm so excited! Photos soon. "Dale Brown has stored my '52Herse for years and three weeks ago I had it mailed. Recent health issues finally made me realize now is the time for refurbishing and riding . 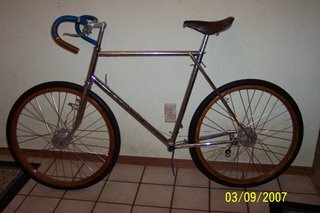 This bike is a year older than me and we both need rebuilt! !.I bought a pair of wheels from ebay gorospil and the front wheel arrived today crushed by DHL. 60's 650b Mavic, Maxi Car hubs. God give me strength !!! I pray the second arrives intact. Life is indeed fragile. Your VeloOrange blog prompted this email. I have accumulated all RHerse parts needed. RHerse front dr, a 60's RHerse triple crank, Herse canti's and all hardware, Herse stem with the owners address imprinted, hand shaped bars unlike any I've seen and the Sologne bag with the decauler ?, RH rear rack and a Singer front rack. Lefol fenders, lights and all the little things too. 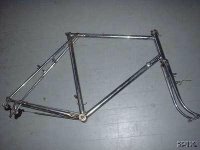 This frame has the Herse bb, wiring thru the frame with the brass thing in the fork and a Simplex rd. Ideale alloy cantle saddle, red Michelin tyres. I'll be taking pix of my redo and posting somewhere. Right now I don't feel good enough to take the pix. I feel blessed to be able to have this opportunity and thankful my lovely wife concurrs. The frame is soaking in Evaporust currently, seems to work well but slowly. 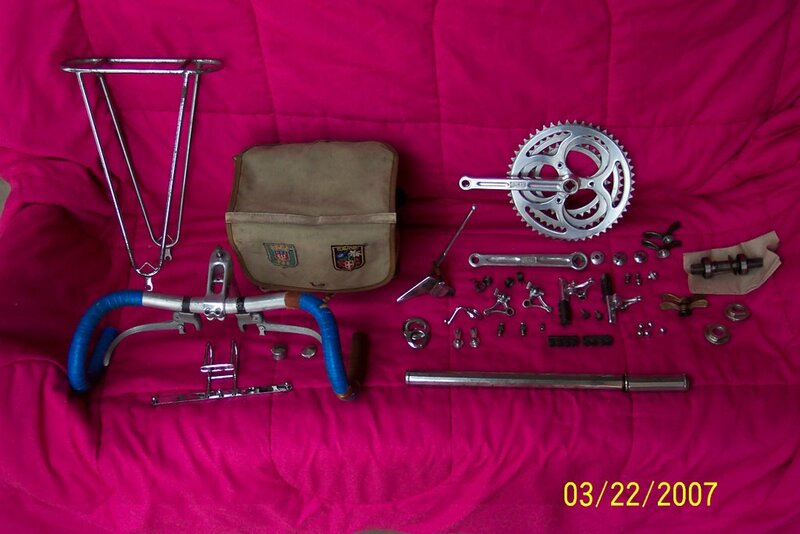 I'm also having a custom built with authenic Herse/Singer lugs, metric 531 from the Singer shoppe, pre war Hetchins rear, current Bates Diadrant fork and crown and a JTaylor curved seat tube .I will buy all of your racks, bags and trappings when we get that far. I'm still deciding on 650b or 700c as I ride a 58-59 and tend toward long and lean 700c since that matches my body." 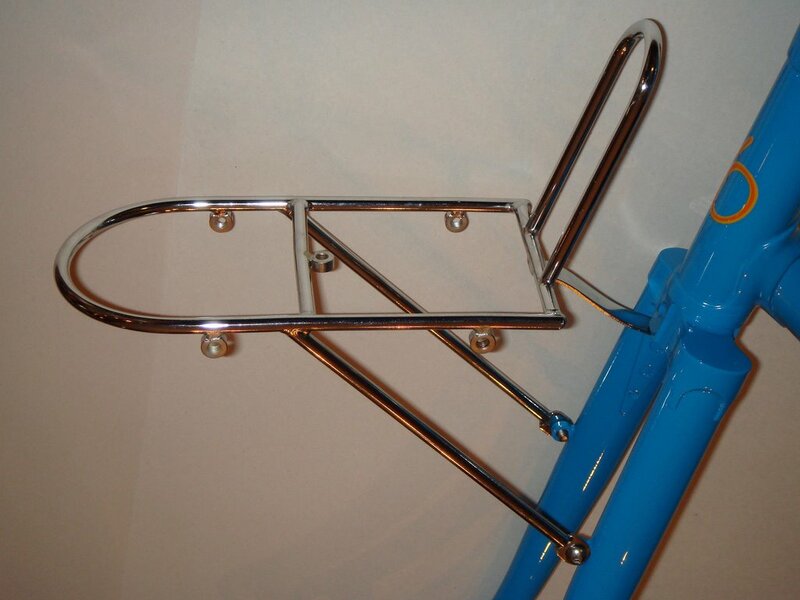 Since we're starting to make French style city bikes we needed a proper French handlebar. And what could be better than a Nitto Promenade bar from, well, Japan. This is a copy of the bar seen on countless continental city bikes and not a few porteurs. 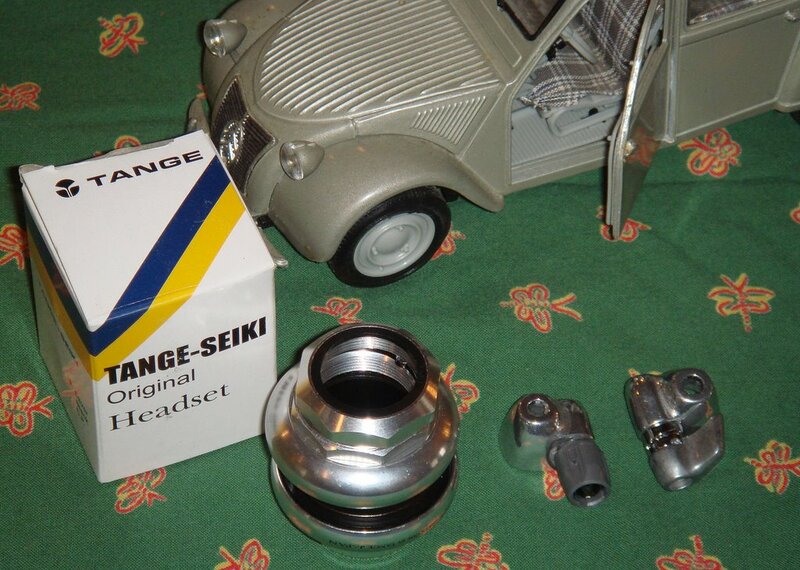 We also now stock the Tange Passage alloy headset. The best $20 headset you'll ever find. It's nicely finished and perfectly acceptable for any city bike. I found a stash of very nice and obviously high end downtube cable stops. The right-side one has a quick adjust lever that's handy. I think these may be DuraAce, but I'm not certain. 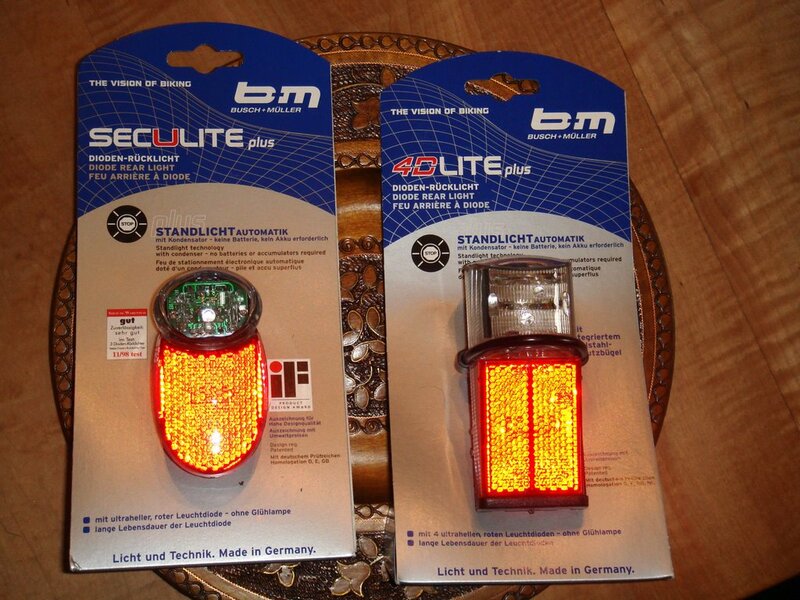 Finally, a city bike needs a tail light, so does a randonneur, so for those of you who like generator powered light we are stocking two B&M models. I'll get the new products into the store later today and tomorrow. As for news, next Monday is VO's first birthday so we'll have little sale. I'll put up a bunch of samples we've bought in the specials sections. 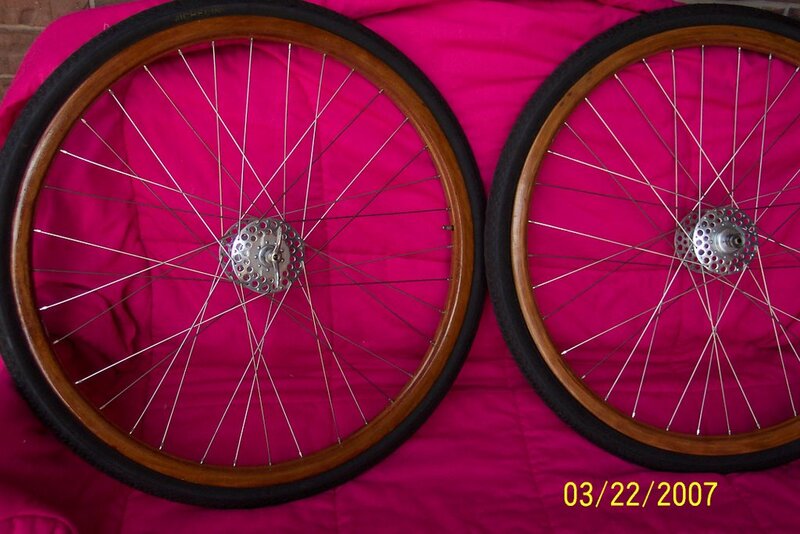 We also have too many 650b tires and a few other odd items. 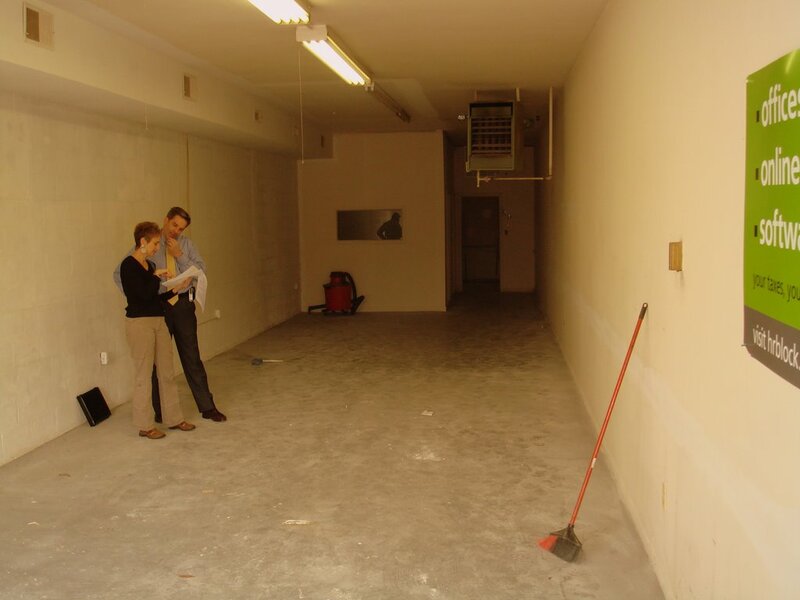 We are very close to signing a lease on a little showroom/retail space so we're anxious to de-clutter before moving in. 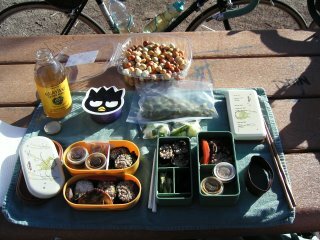 One of the neat things about browsing Japanese touring sites is studying the great photos of food. In Japan food is a very visual art and it can be as much a part of the scenery as the mountains, wildflowers, and babbling brooks. I recently resolved to start taking similar photos on my rides and even bough a tiny camera for the purpose. As a life long amateur, and occasionally professional, photographer I have always had an interest in cameras. I grew up two doors down from a retired photographer who was a great friend and teacher. By junior high school I was tooling around on a French bike with a Leica 3C in my handlebar bag. I soon graduated to a Pentax, then various Nikons, and a part time job in a photo studio. Over the years I've even bumbled into shooting a few magazine spreads, some advertising, and one magazine cover, mostly for editors I knew since I never pursued this sort of work. I know a lot of other cyclists are also amateur photographers so it seems logical to start a discussion of cameras for cyclists. As I see it, a cyclist's camera must be small, have a long battery life, have a built-in flash, have at least some minimal manual over-rides, and be rugged. Digital cameras make the most sense, though I do love film and old Leicas. Most of us display our shots on computer screen or enlarge them to no more than 11 x 14, so an SLR is not really necessary. The small sensor of a digicam may be a compromise, but it is a wise compromise. Likewise, 6 megs. are sufficient and extreme zoom lenses are usually unnecessary. What is important is to have a sharp lens and good software to control noise. There are many sites that offer camera reviews, but my favorite is Steve's Digicams. His reviews are evenhanded and thorough and the "Best Camera" section cuts to the chase. So which camera did I buy? It's a Sony T50 (since replaced by the T100). 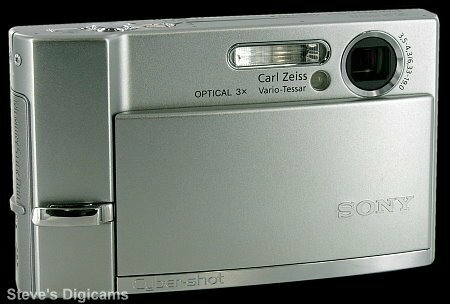 It has super battery life and a strong flash (for a pocket camera), and I can operate it with gloves on. The image quality is as good as any pocket size digicam I've seen. Any thoughts? Please leave your comments about photography, cameras, food, etc. By the way, that first shot is not from a Japanese site. 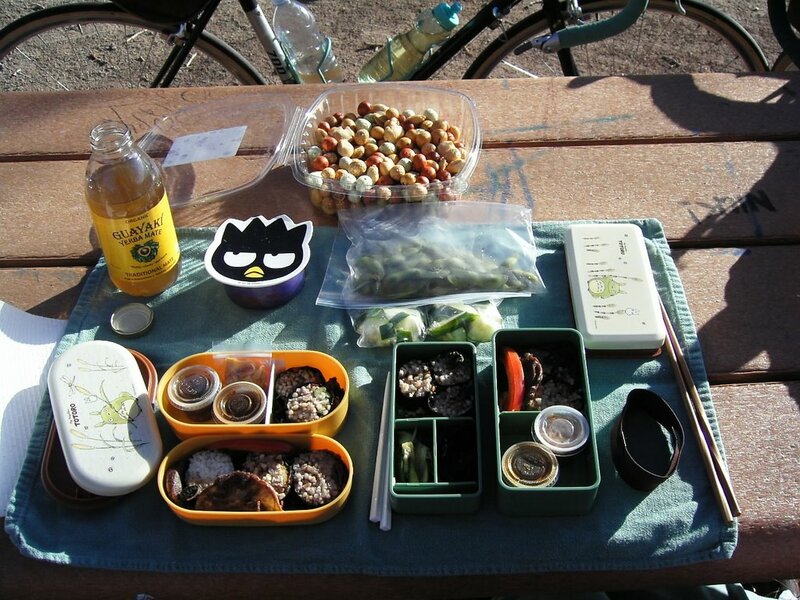 It was sent by Ryan Watson from a "Bike-Picnic last Sunday with homemade sushi in Japanese Bento Boxes my Love gave me for my birthday"! The second image is from the very cool Pass-Hunter.com site. 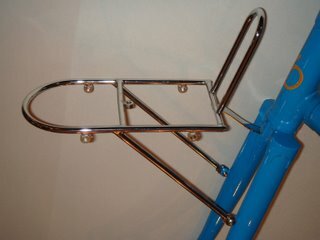 We just recieved samples of our new chrome plated racks and decaleurs from Japan. These are based on our current racks, but are less expensive versions. They will also be made in larger production runs so we won't run out as often. 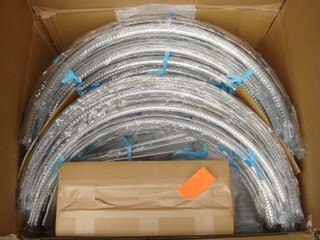 The long term plan is to have two lines of racks, the less expensive chrome plated line of racks and decaleurs made in Japan and a fancy line made from stainless steel here in the US. 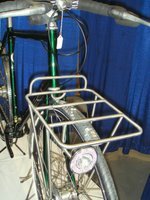 The next version of the US-made front racks will have built-in decaleurs; I don't think that's ever been done on a production rack. A few details about the Japanese racks: First they won't be available until sometime this summer and I don't have final pricing yet. The new racks and decaleurs will be available wholesale to other shops. Please notice the shape of the platform on the new front rack, rounded back corners. 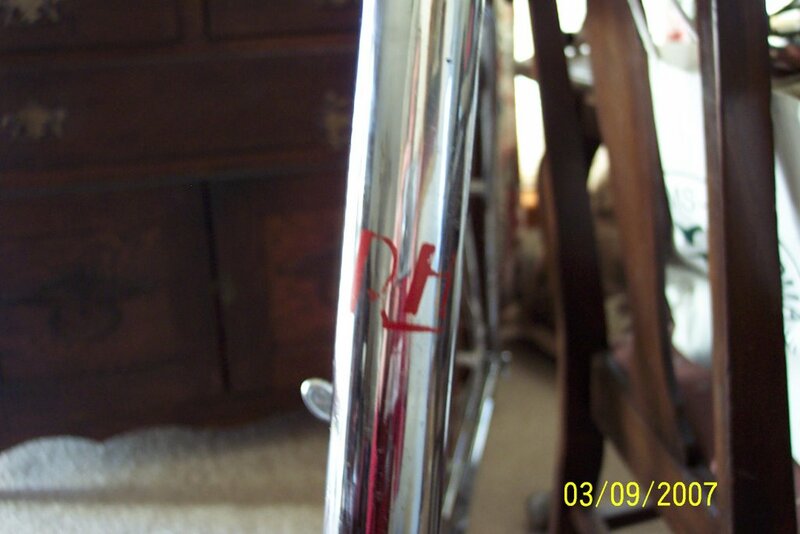 And the chrome is polished, not matt finished as on current Nitto racks for example. Click on the photos for a larger image. Speaking of Nitto racks, we now have the Nitto model M12 in stock. It's designed for bikes with cantilever brakes and at $50 it's a real bargain. Also-this newest version has light mounts on both sides. Finally, we'll have the wider (semi-portuer?) version of the constructuer rack available in a month or two, but we're only doing a small first run of them to see how they sell. 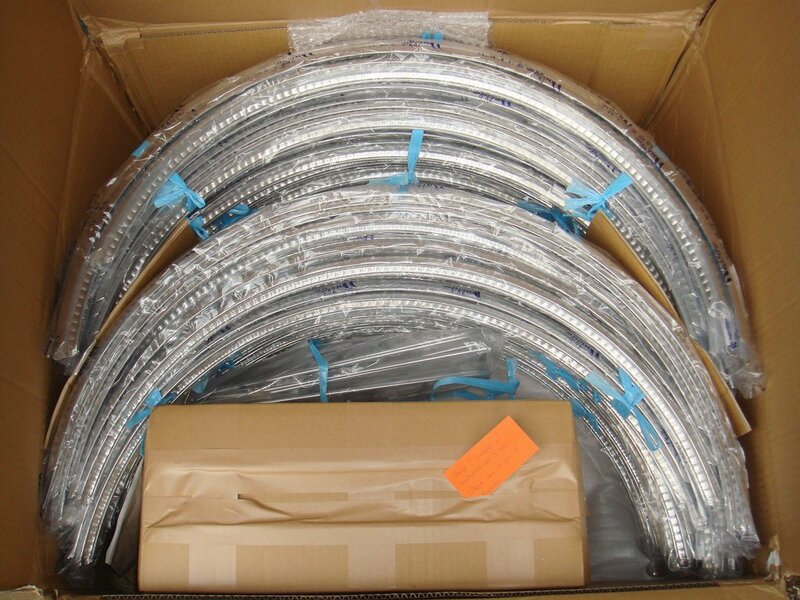 In other news, we hope to have the VO aluminum fenders available in a few moths and we may have found a source for the stainless steel version. While in San Jose I had a chance to chat with Ahren about the VO Pass hunter. Seeing this lovely Toei pass hunter on the "My Cycle Touring with TOEI" site has me obsessing about it again. 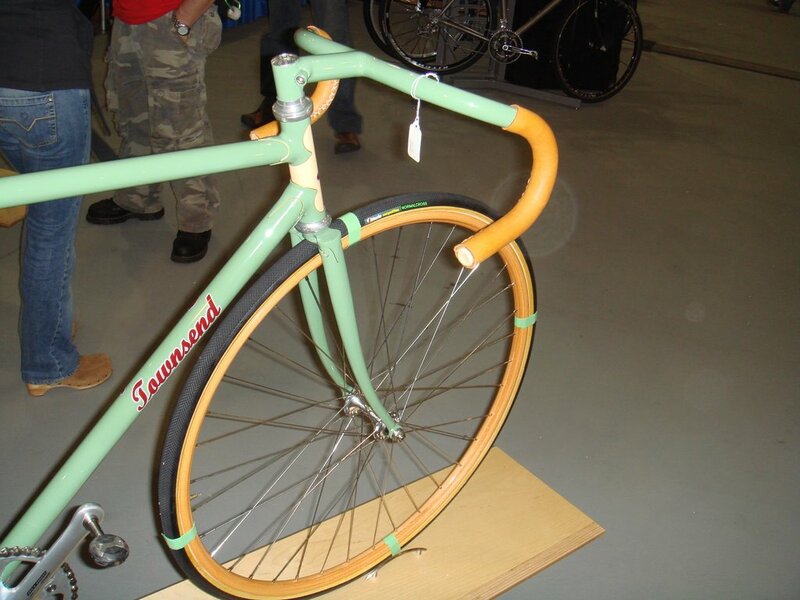 I want this bike to be light enough to rival modern racer-type bikes. It'll probably use Ergo shifting which is easier to deal with when climbing and maybe even, gasp, some of those new-fangled wheels. Yet it should have some of the characteristics of a rando frame, fender mounts, front rack, stable handling, great comfort. One of my goals is to attract the sort of rider who might have bought a modern cyclo-cross bike. 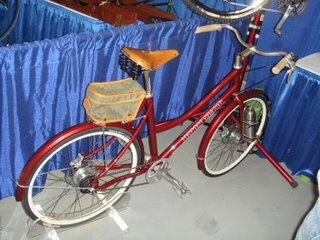 Another is to show the folks on our local bike rides that we are not only interested in retro-bikes. 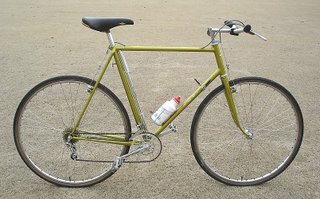 Originally we considered building the frame from Reynolds 953, but the more I learn about that tubing the more problematic it seems. Since Ahren is a super titanium welder, our newest plan is for a Ti frame. I really want to keep the weigh down so I might even consider a carbon fork. We'll start on the frame as soon as we're caught up on city bike orders. 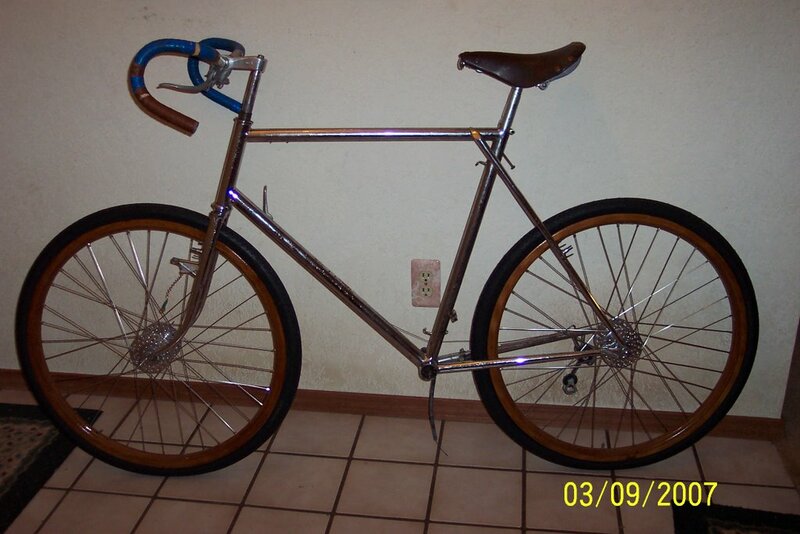 Of course it might be a steel frame again by that time. 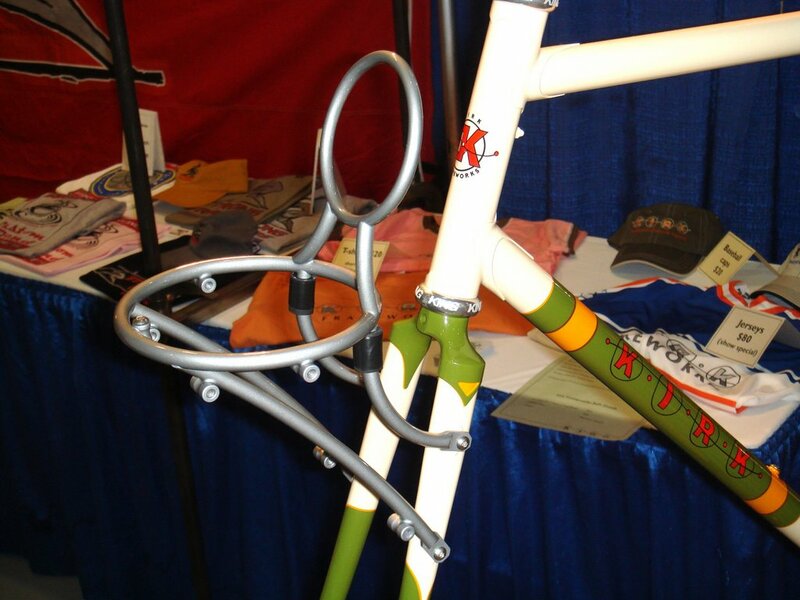 As you probably know Ahren Rogers is building the VO city bikes and racks. Frame #1 is finished and waiting for paint. Ahren brought two bikes to the handbuilt show. 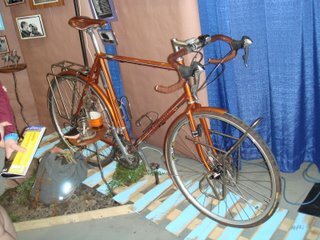 One of them was a mountain bike and the first bike he built under his own brand, Banjo Bikes; he previously built for "Seven". 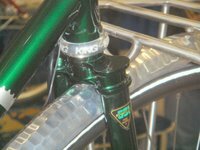 The other was a nice fillet brazed city bike built for a local client. It featured 531 frame and fork with a very pretty double plate crown. The gearing is a SA 5-speed internal hub. The bike is really nicely built with smooth fillets and great workmanship. Please excuse the terrible photos; I had a bit of camera trouble. It's been over 6 months since we ordered them, but the TA cranks have finally arrived, at least some of them have. I'm hoping we get the rest of our order later this week. We should also get chainrings and hardware in a few days. I'll e-mail the folks who reserved the cranks since they get first crack at them and I'll put any that are left over in the store next Monday. The finish on this new batch is spectacular, really a mirror shine. 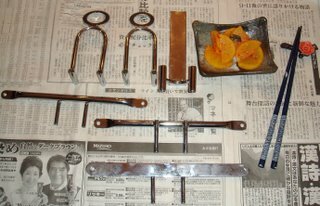 Here is an earlier post about the cranks. There has been some discussion as to whether this is really the final production run of the cranks. I was twice told that it was and it was only being done in conjunction with TA's 60th anniversary. But apparently someone at TA recently said they might do another run if there is demand. Perhaps this run sold out very quickly and TA changed their minds. Who knows? Unfortunately we still have not received any TA pedals yet. 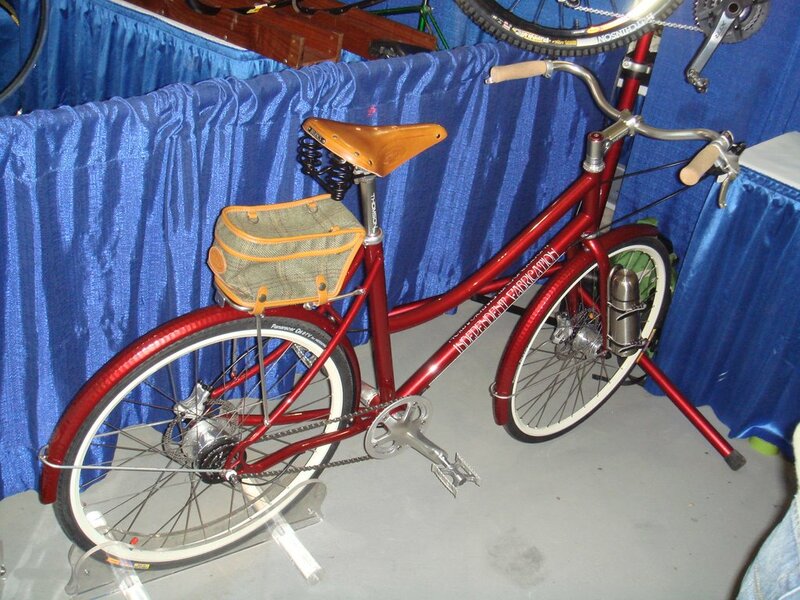 Here are a few little items that really stood out at the hand built bike show. 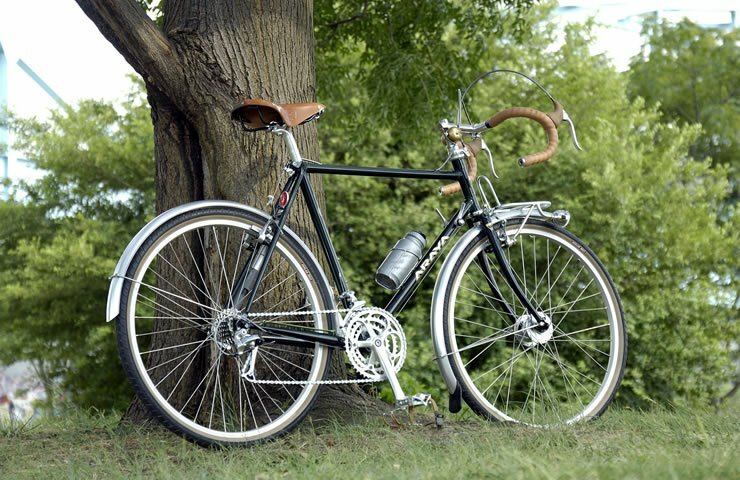 Among my favorites is the custom shifter and front dérailleur on this stunning Pereira. I'm beginning to think that a shifter/ dérailleur like this might make sense on certain bikes and I might just try one on my city bike. The block lining isn't bad either. There certainly was a lot of experimentation with rack design. I'm not sure that the little round rack on this lovely Kirk is practical, but it certainly does fit with the circular motif. Again, I'd stick with a more traditional shape. Another thing that's catching on is wooden platforms on racks. The vacuum bottle on this Independent Fabrications mixte is a neat touch. I'm not sure I could use it while riding though, and riding no-handed while pouring oneself a cup of Earl Grey is a skill every proper cyclist should have. 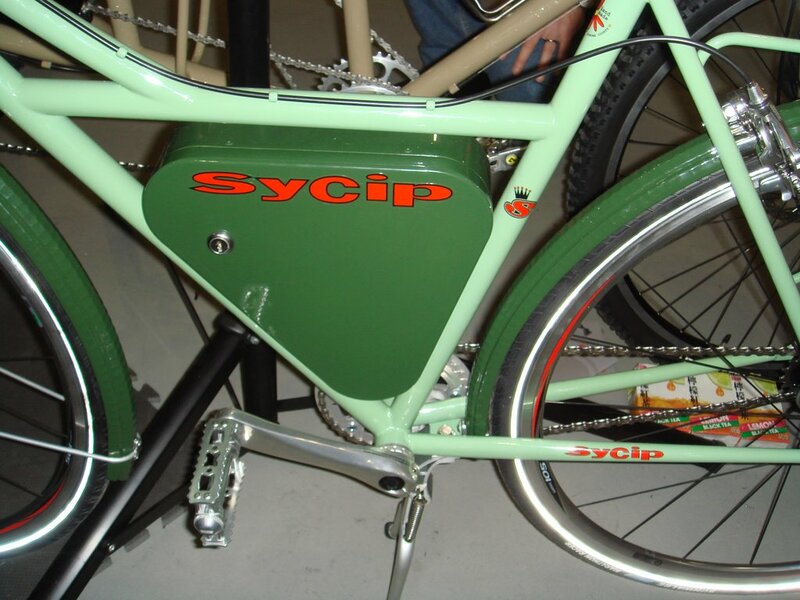 A locking trunk is handy on a city bike so it was nice to see this artful integration by Sycip. 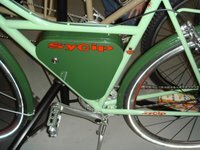 The step-through frame design is very popular on European city bikes and seems to be catching on here in a small way. 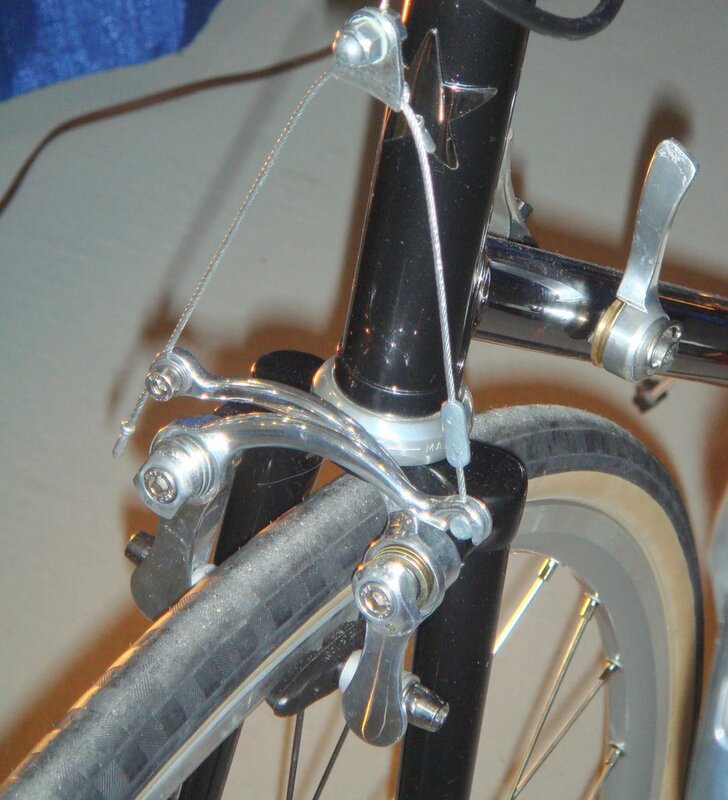 Jon of Johnny's cycles reworked a pair of Paul Racer brakes and the result is a modern centerpull with classic lines. Bravo! I'll post some photos of neat bikes tomorrow. I just got back from the hand built bike show and a short vacation. Here's a link to many of the photos I took at the show. These are still unedited and uncaptioned. This struck me as the year of the randonneur bike. Honjo fenders were evident in more than a few booths. There was also a plethora of front racks. While most of the racks were very well made, some did not strike me as particularly good designs. It really brings home the point that good designs are most often based on those that came before. In this case the racks that were based on or copies of old French designs really seemed best. While there were plenty of fixies, I get the feeling that they are not as popular as a few years ago. It was neat to see more with racks and fenders though. Overall this was a great show and a really fun event. I got to meet and speak with a lot of talented builders and a few who are truly legendary. Anyone who has even a passing interest in bikes should go at least once. Over the next few days I'll post about some of the special bikes at the show. The Grand Bois 700c tires finally arrived and boy are they nice. I just rode a couple of miles with them, but found them very comfortable. They measure 29-30mm and look just great on a bike. They are very supple and light; I'll bet rolling resistance is really low. And unlike the 650b version, these are folding. 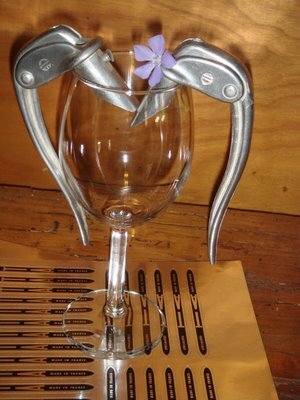 In case you don't know about these, they were designed by the Japanese owner of Grand Bois bicycles (there some great bikes on that site) and I's bike shop. These tires are as close to the old hand made touring tires as you'll find today. Unfortunately the first shipment is completely reserved and we won't have more for about a month. I'll go for a longer ride this afternoon and add some impressions after. 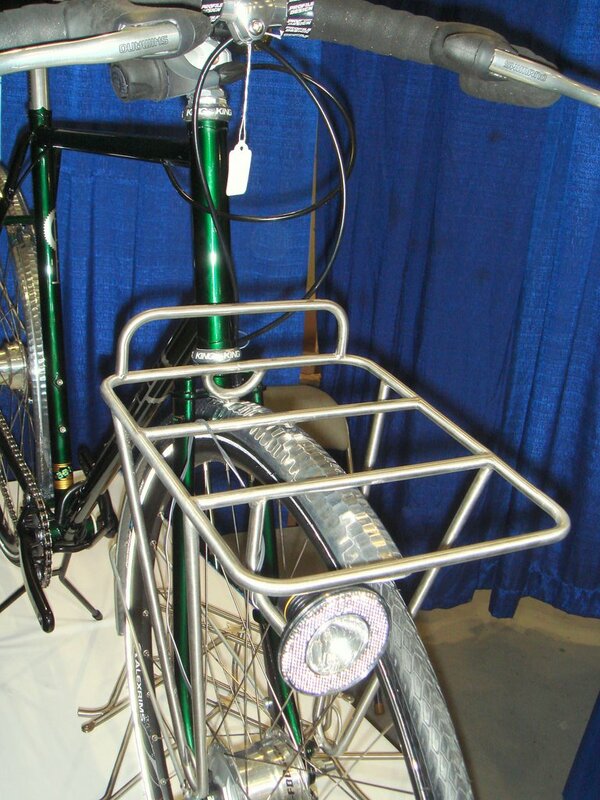 The photo below is of the new Velo Orange Rando rack. I've gotten a few e-mails asking how it mounts so I thought I'd post a photo. Though I designed it for our frames, it comes with P-clamps so it can also be mounted on bikes without the fork blade eyelets. 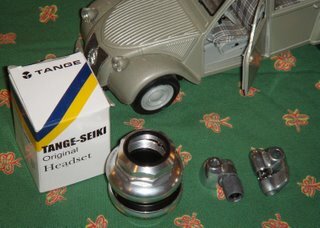 the tang in the rear can be attached to the fender mounting boss as shown, or it can be bent up and attached to the brake bolt. 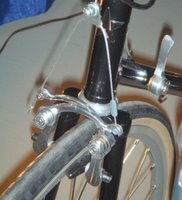 Notice the four threaded eyelets for mounting lights and the fender eyelet. 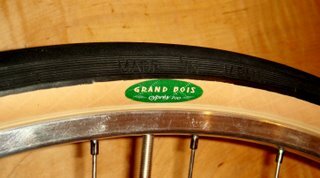 I took a longer ride on the Grand Bois tires and like them even more. I think these will be the standard tires on all my bikes. They feel very light and really absorb the bumps on our potholed back roads. What I notice most is the comfort. They also feel very secure cornering. Grand Bois tires on Rigida 1622 rims with Maxi Car hubs, talk about wheel heaven; that's as good as it gets.